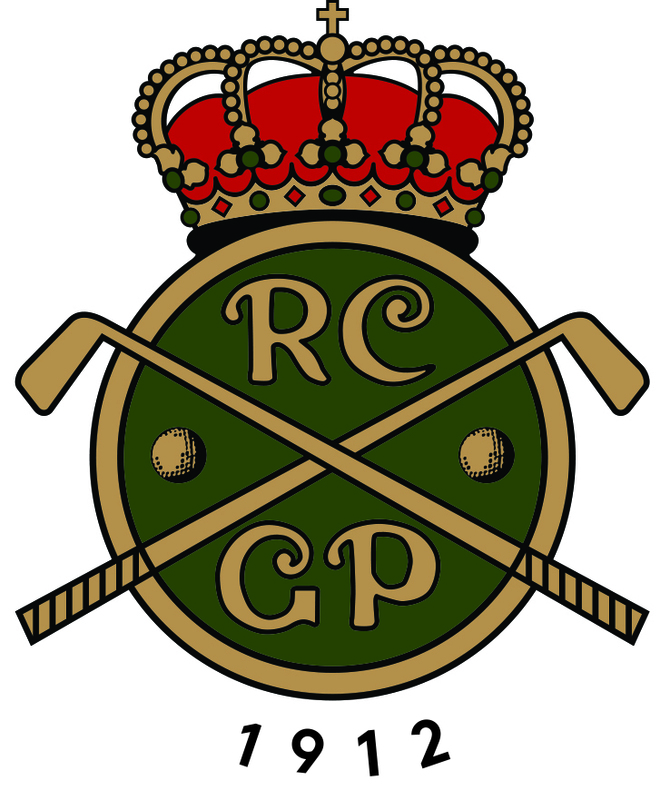 The Open Course is the most well-known of Real Club de Golf El Prat’s five loops having hosted European Tour and Challenge Tour events – most notably the Spanish Open in 2011 and 2015. Comprising the “Abajo” and “Arriba” nine-hole layouts, it is the most demanding course at our club and visitors will end up in trouble if they have a bad day with their driver. And that is very evident on the first hole of Abajo with a daunting fairway bunker that runs along much of the right side of this delightful 400-metre par 4. However, even if your tee shot is good, golfers will find the most important shot on this layout is always the approach as the tricky greens are both very well protected and elevated. 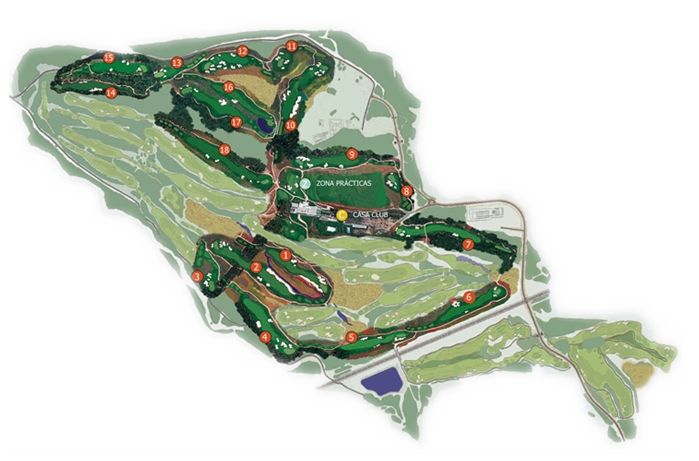 It is important to take advantage of the four par-fives – the longest of which is the 10th on the Open Course, or the first on the hillier Arriba measuring 5,321 metres off the tips. But you must also pay extra attention to the ninth, a par-four stroke index one that is a long and uphill and therefore requiring a powerful drive. A good long iron must follow before reaching the long green that is defended by a bunker on the right and a slight hollow on the left. The 430-metre par-four 17th hole is equally as testing with a hazard running to the left and a sand trap that catches out many golfers. A semi-blind green approach also calls for precision to avoid more bunkers, while the speed of the greens can catch out even the most confident of putters. Making par is quite a challenge on both of these holes. Long par-four requiring a powerful drive, taking care not to go off the fairway to the right as a hazard runs the length of the hole. The second shot requires a long iron to reach a broad green with a large bunker to the left and a waste area to the right. Making par is quite a challenge! Uphill par-five, the green can be reached in two shots by hard hitters. Good drive required to get past the waste area to the right, and a good second shot will usually leave players with a blind approach given the huge bunkers on the right side of the green. The green runs diagonally, making for a hard putt if your approach passes the flag. Par-four requiring power and accuracy. 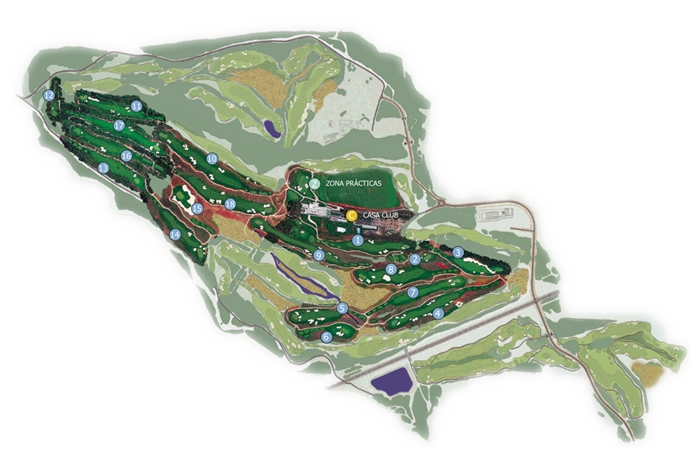 The tee shot is flanked by bunkers to the right and left, and you need a mid-iron for the second shot to land you in a crosswise green that is protected by an array of bunkers in front and a dense forest behind. But to do so, your approach shot must be high and well-placed for the ball to stay on the green. The beauty of this spectacular par five with a dogleg to the right is exceptional. 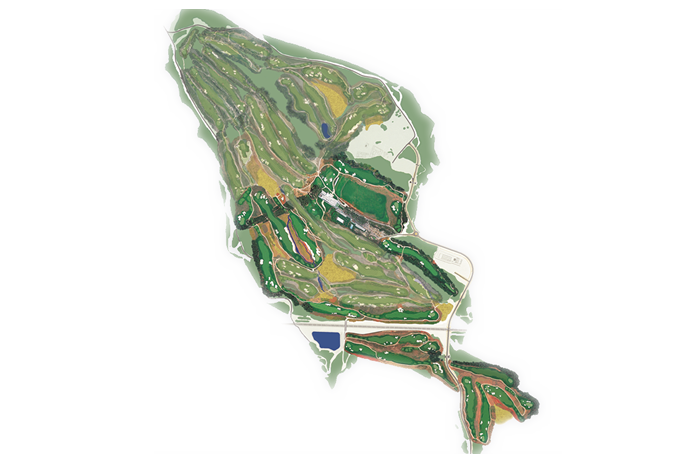 From the tee on high, players must cross a riverbed and then, depending on the tee shot, get over or around a huge pine tree on their second shot. The approach to the green involves a steep incline that players must bear in mind to avoid getting trapped in one of the many deep bunkers along the way. Magnificent par three demanding a strong, high tee shot to pass the front bunker defending the narrow green, set slightly higher and in diagonal to the tee. 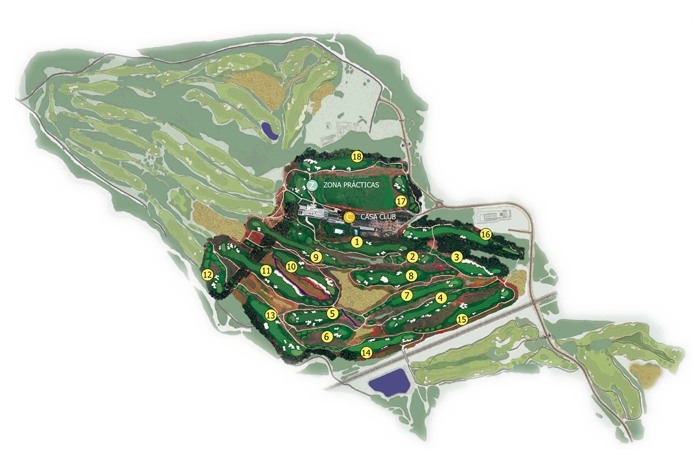 Course designer Greg Norman’s preferred hole. A demanding uphill par four with a dogleg to the left, where players need to be on their game to avoid the seven bunkers that surround both tee and green. The tee shot must search the fairway taking into account the steep right-left slope, and the second shot has to combine the adequate line and distance to reach the green. Recovering from failure to reach the green is quite a challenge. This long par three requires a long, accurate tee shot to avoid the bunkers that line the long green. No half-measures here, but veer too far away from the centre line and you will be hard put to save par. This par four (dogleg left) enters the wooded section of the course. The tee shot requires more accuracy than distance, the main goal being to avoid the bunkers on the right side of the fairway. Once you reach the fairway, the approach shot to the green is tense because of hazards on either side, but with a short iron you should have a good chance to trim down your score. This par four has one of the course’s toughest opening shots. The forest and bunkers on both sides of the narrow fairway (dogleg right) make it essential to choose your shot and club very carefully. After a successful tee shot, the approach to the high, narrow green that spreads diagonally has to be very accurate despite the short distance. The tee shot is of the essence on this par four. If you reach the steep downward sloping section of the fairway, the second shot has to be very short. Otherwise the distance will be considerable, and a highly accurate shot will be needed, bearing in mind the array of bunkers and the lake to the right that defend its dual-platform green. Tough uphill par four where the tee shot once again is key. The bunker on the right of the drive’s descent is one of the most frequented areas of the course as players are forced to avoid the hazard running along the entire left side of the hole. The semi-blind green approach requires a high, well-directed flight to avoid the bunkers at the front and rear of the green, leaving a long putt on its fast surface. This par five is a hole where orderly play has its reward, but any mistakes, particularly on the left side, can create havoc. The setback of the tees calls for great care on the opening shot, while the second shot presents a wealth of bunkers to the right of a narrowing fairway and a hazard to the left. The narrow, elevated green requires precision to avoid having the ball roll off. Heavy hitters can reach the green in two.